This fruit is known to me as "buah long long". I've also heard that the Malay name for it is "buah kedongdong". Quite a cute name, either way. The "buah long long" fruit has a leathery skin and a thin layer of pulp. The pulp is either eaten fresh, pickled with vinegar and chilli, or made into juice or jelly. It is not a common fruit to find.. even in Singapore. I've had the drink before in Penang as well and have heard that it is also available in Indonesia. 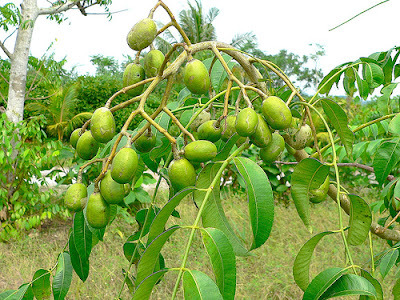 The "buah long long" tree is a useful tree.. and I find it strange that it is not more widely cultivated. The fruit is supposedly "cooling" (ie dispels "heatiness") and diuretic. The roots and bark too, have medicinal value - can be consumed and also used for external application. In any case, the juice of the "buah long long" tastes great - a bit like lime juice but with a more grassy flavour. With a lot of ice and a sour plum, it is a great drink to have on a scorching hot Sunday afternoon. Not many stores sell this drink now.. I find this at a Penang restaurant called Gurney Drive at Ang Mo Kio. P/S: I used I could reccomend this restaurant because I personally love Penang food. Unfortunately, the food used to be a lot better when the restaurant first started. Our assam laksa today was rather disappointing. I'd be writing to them about it.. because there aren't many places where assam laksa is available in Singapore! Watch this space for more! I went to lengths to get the tree. Because the drink can hardly be found here. It's hard to find at my place too! This is purely "village tree"
The drinks that you mention is truely tasty!